for thy pleasure all combine. The Israel Museum recently acquired an inscribed pomegranate, which was probably a gift to the Temple of Yahweh in Jerusalem. The thumb sized ivory pomegranate has a long neck with six elongated petals. The body is solid with a small, rather deep hole in the base, probably for the insertion of a rod. Around the shoulder of the pomegranate is an incised inscription in paleo Hebrew script, part of which is missing. According to its paleographic style, the inscription dates to the mid-8th century BCE. The text was reconstructed based on the surviving text and biblical evidence. The inscription reads: sacred donation for the priests of the house of Yahweh. 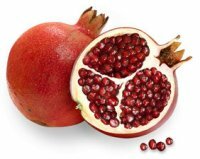 This pomegranate is the only known relic associated with the Temple built by King Solomon on Mt. Moriah in Jerusalem. Copyright © 2001-2009 The Fleece. All rights reserved.